I’ve got several art markets planned for October through December 2018. I hope you’ll stop by! You’ll find me in the Dance Room! Event details on Facebook Enjoy holiday shopping and local food & produce at this great market! Holiday shopping event and fundraiser. $10 entry fee includes a glass of wine for sipping while you shop! 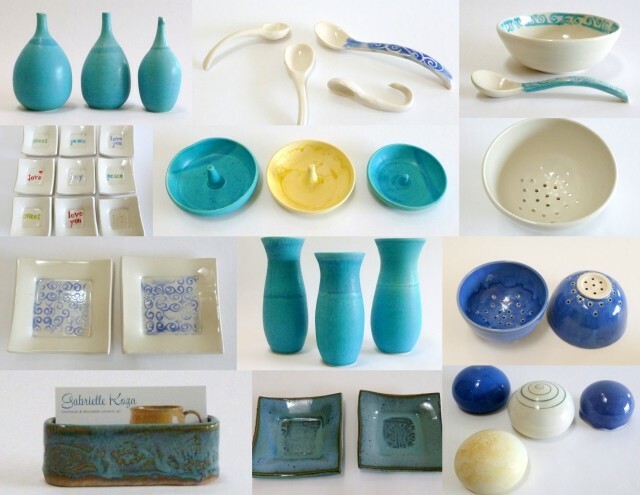 I’ve started an instagram account for my pottery @gabkpottery. I hope you’ll follow! Posted in Uncategorized | Comments Off on Hello Instagram! My last public show before Christmas 2016 is planned for this Saturday, December 3, 9 am – 1 pm at the Gilbert Art Walk in downtown Gilbert. 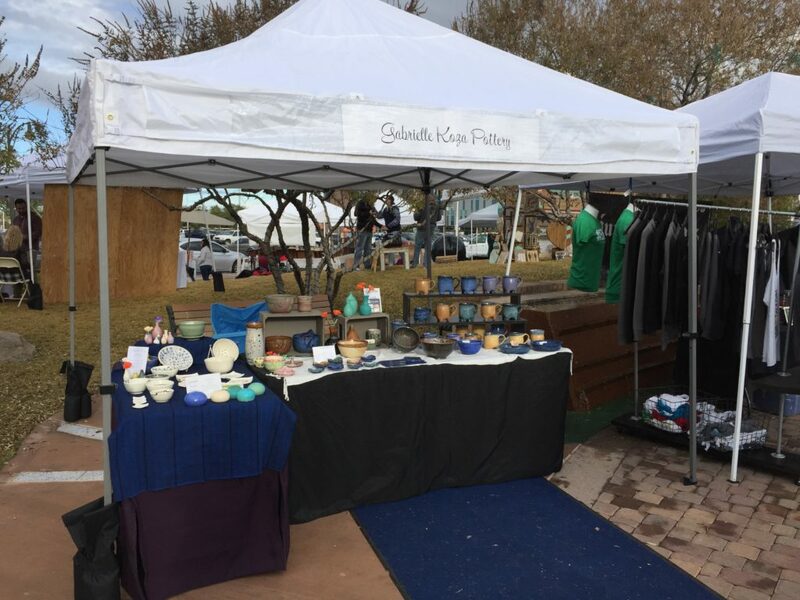 The Gilbert Art Walk is a fun market packed with local makers and artisans. 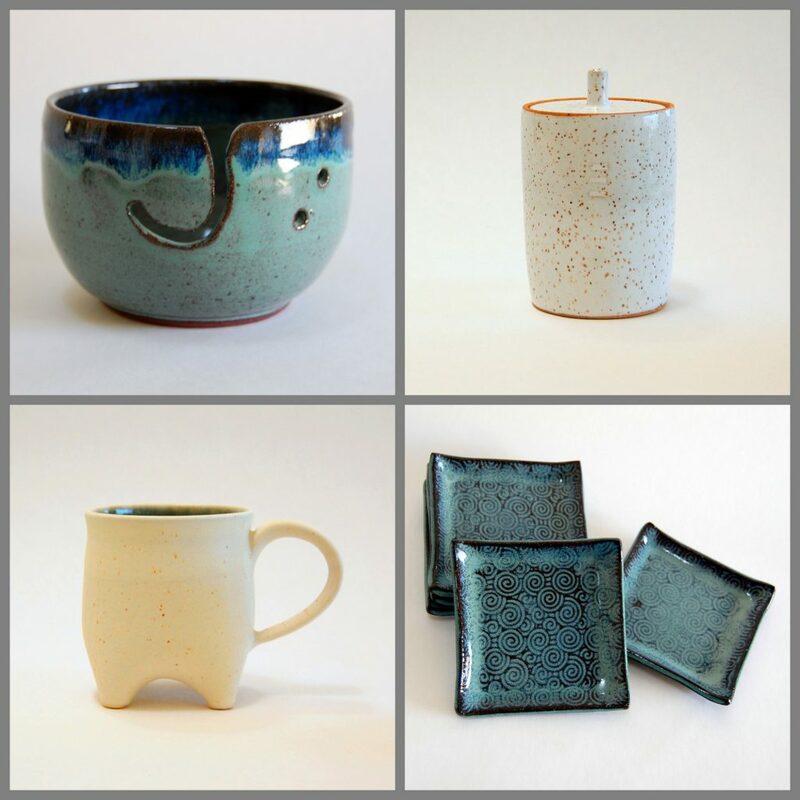 It’s a perfect place to find unique, local, hand-made gifts. A bonus, it’s right next to the amazing Gilbert Farmer’s Market, which runs until noon. If you can’t make it this Saturday and still have some Christmas shopping to do, contact me and we can set up a time to get together. Come by the Pyle Adult Recreation Center this Friday and Saturday to see me and my friends. We’ll have tables in the Dance Room. This is a fun event with a wide variety of arts and crafts. The Pyle Center is located at 655 E Southern Ave in Tempe. The Boutique runs 9-4 on Friday and 9-3 on Saturday. Gilbert Art Walk is an open-air, family friendly, pet friendly, art show with live music that is free to the public. It is located in Water Tower Plaza, on Page Ave in downtown Gilbert. The festival happens on select Saturdays October – April, right next the very wonderful Gilbert Farmers’ Market. 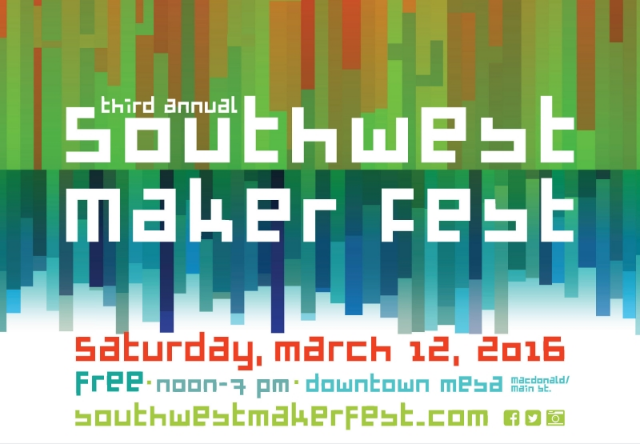 I am on the planning committee for Southwest Maker Fest, a very cool FREE one-day festival in downtown Mesa. 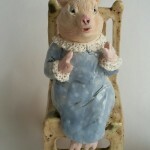 This year I am sharing a booth with some of my clay friends: Mary Anne, Renee, Kater, and Connie. We’ll be taking turns running the booth and giving demos throughout the day. Our booth will be on Pepper Place just west of Macdonald. Besides our booth, there are all types of awesome artists, engineers, upcyclers, programmers, and crafters. Many of them will be giving tutorials and workshops. You can learn to weld, code, knit, reuse common household items, and relax. You can also participate in collaborative projects, listen to music and story telling, and learn how to grow a better garden. It’s a very family-friendly event with FREE admission to the i.d.e.a. Museum all day. Schedules and exhibitor lists can be found on the website southwestmakerfest.com. I hope you’ll come and enjoy this one-of-a-kind festival! Here are some time lapse videos of me throwing, then trimming a textured cup. I don’t work nearly this quickly but a real time video would be quite boring. I’ve just run a glaze kiln and still have more glazing to do. 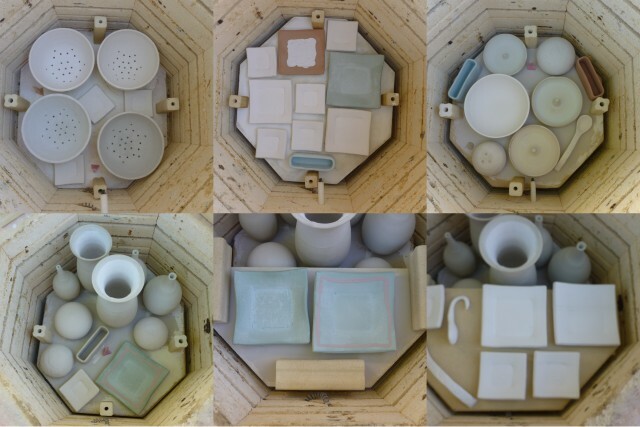 Packing the kiln for a glaze firing is a bit of a puzzle. In this kiln I had a few tall pieces but mostly a lot of short pieces. I ended up with 4 full size shelves (including the bottom shelf) and 2 half shelves. I didn’t have any small posts left for the top shelf so I turned 3 wide posts sideways. The top image shows each shelf load from bottom to top. The lower 3 shelves are below the kiln’s pyrometer which you can see in some of the images. The kiln has a controller that reads the temperature from the pyrometer to control the heating of the kiln. I am happy with the results. 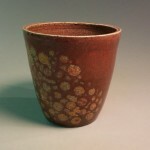 I did have a couple of spots where glaze ran and I found that some of the underglaze that I used burns out at cone 6. Now back to glazing and loading for one more kiln load. I am making these items for upcoming shows. 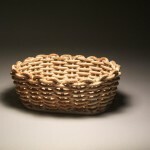 I will show with the Southern Arizona Clay Artists in the Tucson Museum of Art’s Holiday Artisan Market Friday, November 21 through Sunday, November 3. I have also reserved a space at the Gilbert Art Walk for Saturday, November 29 and Saturday, December 6. 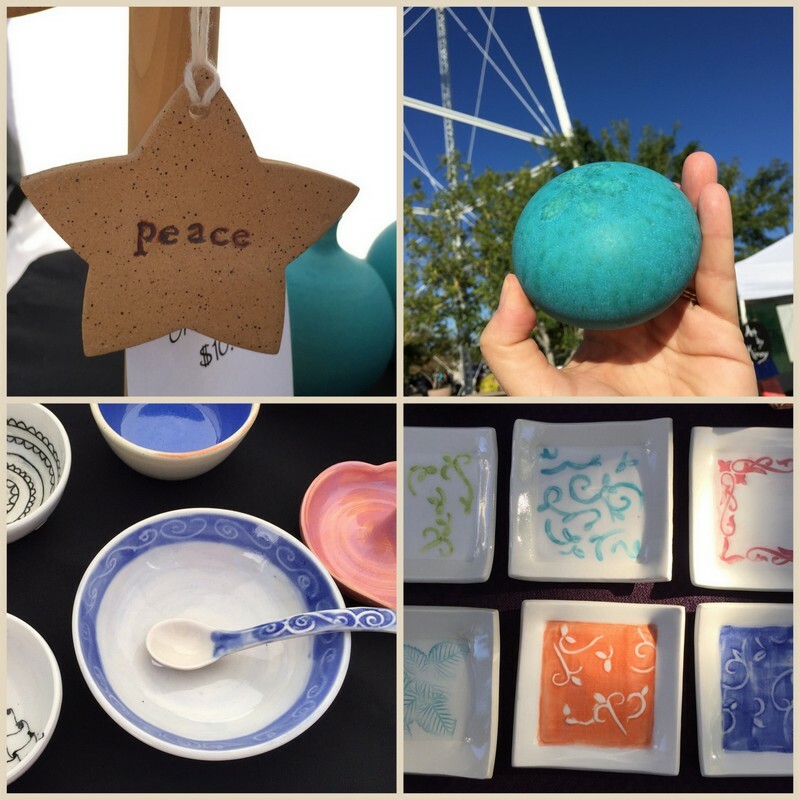 I’ve been selling my pottery at the Tempe Community Market once or twice a month for the past few months. This market started earlier this year and has many wonderful local vendors of produce, food products, art, jewelry, and more. A special feature of this market is that a percentage of all sales support the Tempe Community Action Agency, an organization with substantial programs to combat poverty and end hunger and homelessness in our community. Summer hours for the market is Sunday 8a -12p. The market is located next to the Marquee Theater on Mill Ave, just north of the Tempe Town Lake. You know you want to check it out! 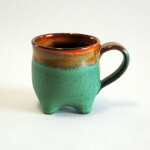 I usually share a spot with my friend and fellow potter Connie Schultejans of Flutterby Pottery. 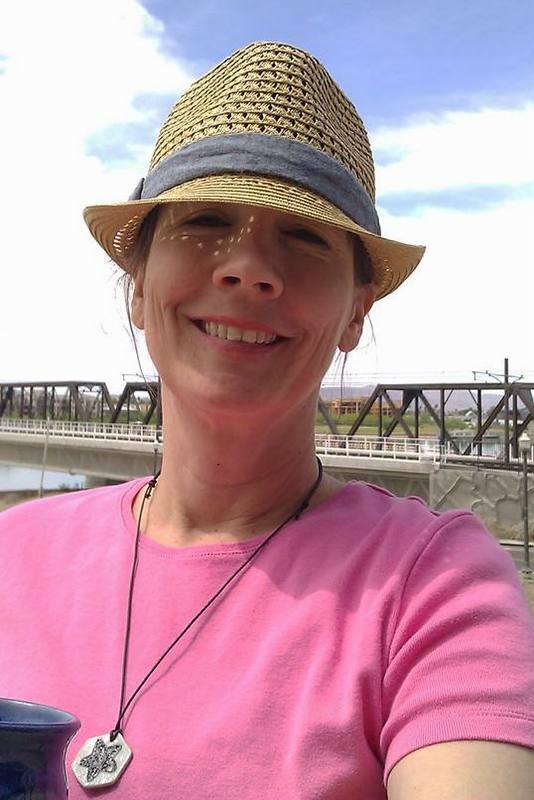 Check my Facebook page or the sidebar of my website to see when I’ll be there next.